Fleeing her abusive boyfriend, Jean (Jennifer Lopez) and her 11-year-old daughter head west to her father-in-law Einar’s (Robert Redford) Wyoming ranch. Einar’s longtime friend and ranch hand Mitch lives on the ranch where Einar cares for him. Mitch needs daily shots of morphine to handle the pain he suffers from injuries he received when a grizzly bear attacked him. Mitch is full of compassion for Einar who continues to mourn the death of his son and to blame Jean for his son’s death. The unexpected and threatening arrival of Jean’s ex-boyfriend forces Jean to confront her past. 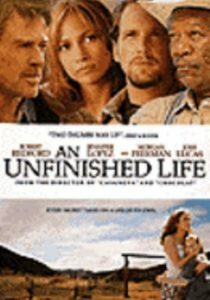 An Unfinished Life is a heartfelt story of healing and forgiveness. This entry was posted in Mary K. and tagged drama, movie on September 16, 2016 by jamiea.